This is a permanent position with an exciting, growing company in the heart of Boulder. Strong salary, benefits, vacation and other perks. An exciting time to join...going ' big' with revenue generating software product line. Been in business for 8+ years. Have dialed in the product line and customers. Have a good foundation. Now moving forward to the next phase...an exciting time to join. Looking for 2+ years of React.js experience. Looking for 5+ years of professional software development experience. Experience building apps with RESTful API’ s or GraphQL. Just let me know if I can tell you more. I' ll send you full company details and tell you all about this...then you can decide if it makes sense for you. Thank you! 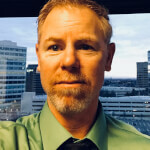 Aaron is the Denver Market Manager for EdgeLink and brings 20 years of technology recruiting experience in the Colorado market. He joined EdgeLink in 2010 to build the Denver office where he’s built a team of up to 17 employees while at the same time being a top producer. Since joining EdgeLink, Aaron has been a President’s Club winner 4 times, as well as the EdgeLink MVP. Aaron and his wife truly enjoy “life on the ranch” together along with their dogs and horses. While he loves quality time with his family, Aaron is also a former motocross racer that loves thrills and adventure. He loves skiing, backpacking, fly fishing, and horse packing in the Colorado Rocky Mountains and all that life in Colorado brings with it.